My best friend came to town this weekend and promised to help me cross something off my list. We did it! Amy and Shayna, may I introduce my neighborhood watering hole, Tuman's. Tuman's, please meet my lady friends. While home to visit the family this weekend I learned it happened to be the Wayne County Fair! I may not enjoy tractor pulls or portable twirling rides, but my hometown fair reminds me of several fond memories.... long nights sewing 4-H projects and ELEPHANT EARS!!! Noting the #14 on my list of things to do before my birthday, I decided it was necessary to drag the family to the fair for elephant ears on Father's Day before returning to the city. 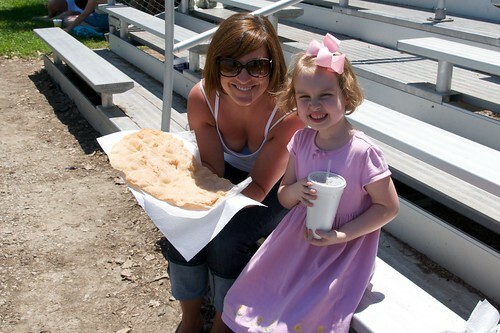 After all, it was my dad who taught me to appreciate the fried dough goodness! One down, 29 to go!! 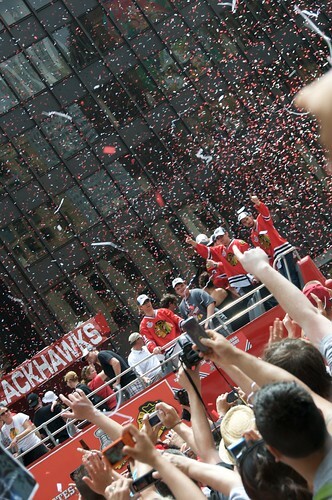 If you haven't heard already, the Chicago Blackhawks have won the Stanley Cup for the first time in 49 years. 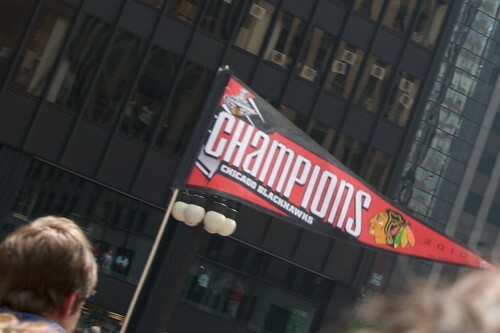 Now, I may be crazy, but I don't remember a whole lot of hoopla over hockey around here when I lived just a mile from United Center just two years ago.... but people have come out of the woodwork lately to cheer on our hometown hockey guys. 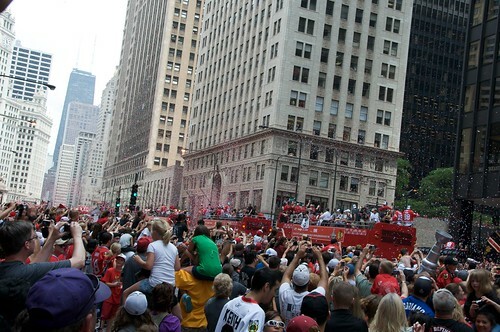 More than two million, in fact, came downtown for the parade yesterday.... and I wasn't going to stay in the office and miss it. These photos don't even begin to describe the excitement, but I tried my best! As I'm sure you've noticed, my last blog post was my first in quite some time. I've been really busy with my new job, but that's really not an excuse. 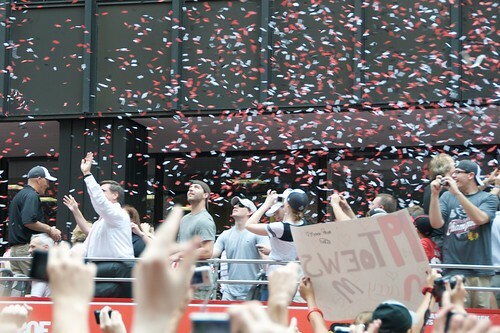 Time has just seemed to fly by this spring, and I have a feeling the next seven months will go by just as fast. The next six, however, mark the end of my twenties - the true end of an era. 1. 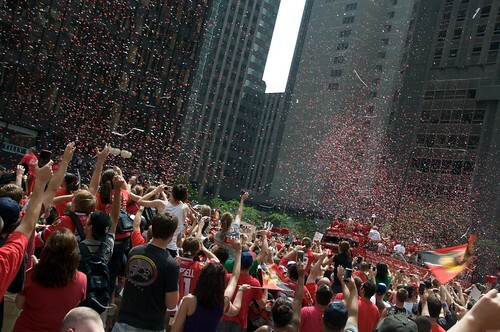 Go to the Art Institute of Chicago. 2. Hang the chandelier in my bedroom. 3. Cook one new recipe per month. 4. Go to a Bears game. 5. Have a constructive, positive six-month review at my new job. 6. Buy ice cream from the neighborhood ice cream man. 8. 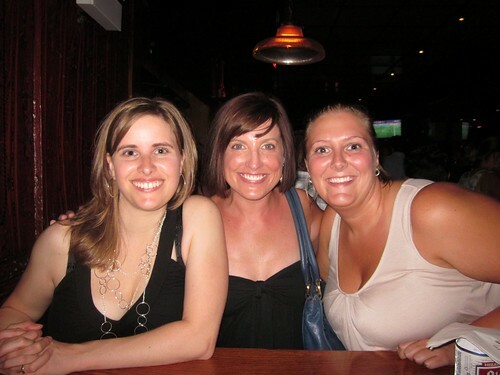 Take the girls to Tuman’s. 9. Ice skate at Millennium Park. 10. Never hop on a scale, yet continue to "buff up" and stay fit. 11. Stay out until 4 a.m. one last time…. and live to tell about it. 12. Do something that raises money for a charity close to my heart. 13. Cook with fresh herbs from my back porch garden. 14. 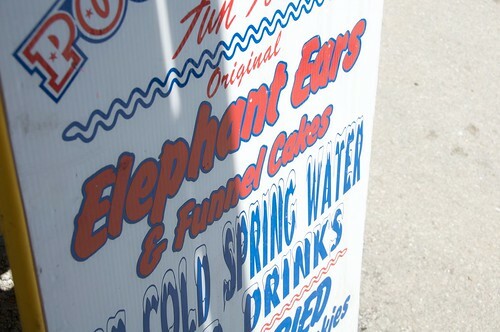 Track down an elephant ear, even if it means going to the Wisconsin State Fair. 15. Take a cooking class. 16. Do something special for/with my Mamaw and Papaw Brock. 17. Give a homemade present to everyone on my Christmas list. 18. 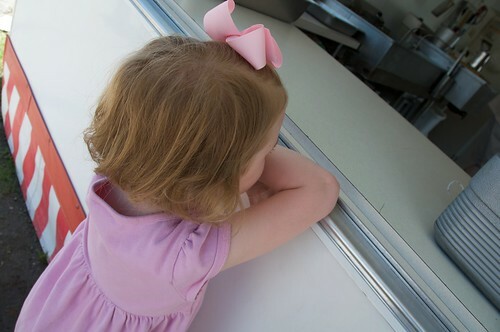 Eat ice cream at Margie’s Candies. 19. Go to a concert at Millennium Park. 20. Conquer my fear of driving in the city. 21. Blog, sew or photograph something at least one per week. 22. Have a dog at Hot Doug’s. 23. Play putt-putt at Grant Park. 24. Share my city with my niece, nephew and big brother. 25. Eliminate any credit card debt. 26. Enjoy the view from the Tasting Room on a clear night. 27. Plan a vacation to Napa. 28. Conquer my fear of the yoga studio. 29. Capture Ukie Village neighborhood attractions with photos – the neon signs at Alcala’s, St. Stanislaus Kostka Church, etc. 30. Be thankful for all those who have blessed my life in the past 30 years and have faith in what lies ahead in the next 30 years. And to remind myself of this list, I have set my new phone's ringtone to Kei$ha's "Tik Tok." You can all laugh at me, it's OK. I finally planted flowers today. And of course, before I was even finished, my squirrel neighbors were checking out the action. You see, there are things people warn you about when you move to a big city: be aware of your surroundings, don't give out your address to strangers, watch out for shady cab drivers. 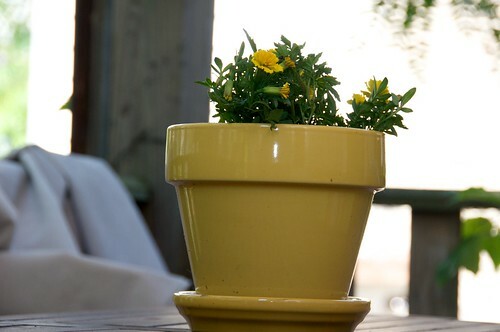 No one, I mean NO ONE tells you that squirrels will ruin your potted plants because they have a hard time finding dirt in other places in which to bury their nutty treasures. Last year they fully uprooted all but two of the plants I potted. This year, I think I'm ready for them. 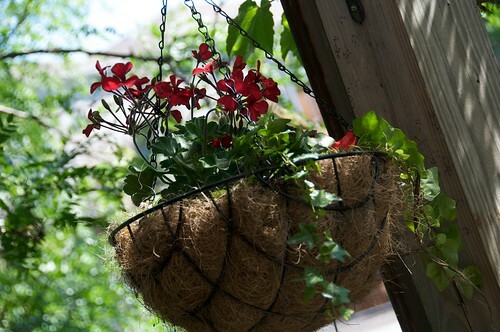 I've got a modern version of a Geranium, a bit of ivy and something with darker leaves and red flowers in each of my hanging baskets. What the red stuff is, I have no idea, but the lady at Sprout Home, my local hippie gardening spot, thought it would be perfect for a north-facing, shaded hanging basket. I do not have a green thumb, so I took the lady's advice. She won me over by suggesting the "Critter Ridder" spray I had already purchased at Ace Hardware. Last year her colleagues told me how awful chemicals were for plants and animals, and suggested I use Cayenne pepper to ease my squirrel problem.... and we now all know how that turned out! She also told me marigolds were on squirrels' nasty list, so got a bunch of those to plant as well. 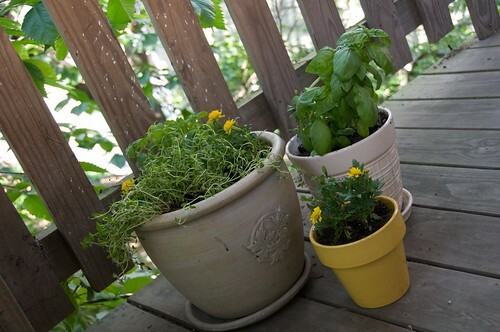 They're not my favorite, but if they'll ward off squirrels to keep my herbs alive, they are OK by me. Wish me luck in my quest to keep plants alive - and squirrel free - for the next 3 months!! !